Chandler, Ariz. (April 19, 2016) - During its 9th Annual Leadership Awards Luncheon, the Native American Finance Officers Association NAFOA) honored the achievements of a tribal leader, tribal CEO, financial venture advancing tribal economies, and an education program promoting tribal entrepreneurship. The awards were presented during NAFOA’s 34th Annual Conference, held at Gila River Indian Community’s Sheraton Wild Horse Pass Resort. Ernie Stensgar, vice Chairman of the Coeur d’Alene Tribe received the prestigious Tribal Leader of the Year Award. Holly Gagnon, CEO of Chumash Enterprises, owned by the Santa Ynez Band of Chumash Indians was honored as the Executive of the Year Award. The Navajo Nation won the Deal of Year Award and the Kiwi Café was this year’s recipient of the Education Program of the Year Award. “The Awards Luncheon is an opportunity to honor elected tribal leaders, financial professionals, and capacity building programs that help to create job growth and economic opportunities. We believe tribal economies are strongest when armed with the tools to make sound financial decisions,” remarked NAFOA’s President Bill Lomax. 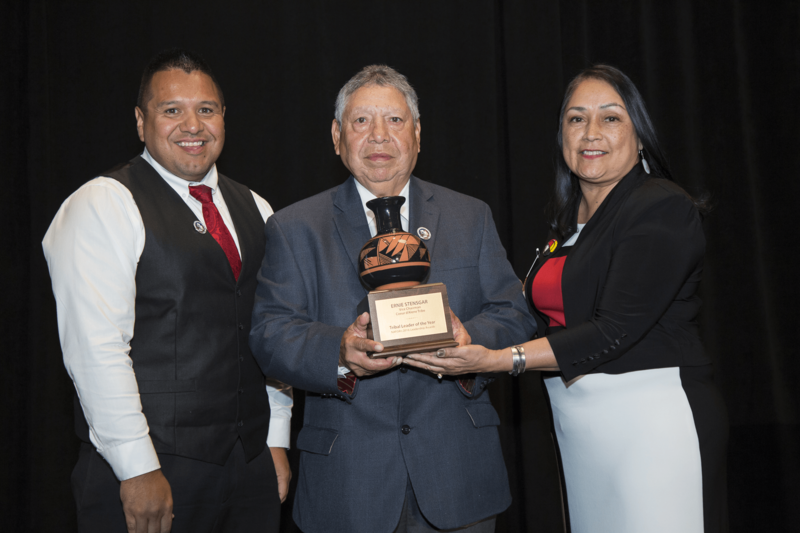 NAFOA presented Ernie Stensgar, vice chairman of the Coeur d’Alene Tribe, with its prestigious Tribal Leader of the Year Award. From being awarded a Purple Heart for his service to our country to leading an economic revitalization for his tribe that has an annual economic impact of $330 million, Stensgar has exhibited the utmost candor and sound judgement in every position he has held. Most importantly, Stensgar displays an unwavering courage to champion tribal rights in his over 30-year career in council that inspires all of us to do the same. It is clear that “Vice Chairman Stensgar is an exemplary tribal leader. His commitment to tribal rights extends beyond his service to his own tribe,” said NAFOA’s Vice President VaRene Martin, at the luncheon. NAFOA presented Holly Gagnon, CEO of Chumash Enterprises owned by the Santa Ynez Band of Chumash Indians, with its distinguished Executive of the Year Award. Over her 20-year career, Gagnon has consistently led gaming enterprises to success by increasing margins, stabilizing finances, and recruiting experienced and respected executive teams. NAFOA is honored to recognize Gagnon not only for her proven leadership but also her work in the community. She is a founding board member of Global Gaming Women, where she chairs the mentorship committee. She has also been instrumental in helping to launch a mentoring program for Native American high school-aged girls. NAFOA also honored the Navajo Nation with the Deal of the Year Award for a groundbreaking $52.9 million general obligation bond issuance that will not only fund public safety programs for the tribe but can also reshape how tribal entities finance public projects. A tax-exempt general obligation bond issuance by the Navajo Nation opens up an important avenue for tribal projects on a long-term basis that are not secured by a direct income stream. KeyBanc Capital Markets, a member of the Navajo Nation finance team, believes this bond to be the only unsecured general obligation bond of its kind in the capital markets. Kawi Café is this year’s recipient of the Education Program of the Year Award for its innovative entrepreneurial business-training program. Launched by the Cherokee Nation Commerce Department in 2013 and officially opened in 2014, the Kawi Café provides Cherokee citizens with a hands-on learning program that combines job training and classroom-style instruction in a quaint coffee house setting. Nine aspiring entrepreneurs complete the program at a time and learn how to run a business and spend one day a week working on a business plan. By introducing job skills and experience to Cherokee communities, Kawi Café is on the frontlines of ending local economic stagnation. The luncheon is a yearly event, attracting an audience of over 500 to celebrate the dedicated individuals that contribute to the economic strength of Indian Country. NAFOA is a national non-profit organization whose mission is to strengthen tribal economies by: promoting excellence in financial management, advocating sound economic and fiscal policy, developing innovative education initiatives, and providing essential information, resources, and support to meet the challenges of economic growth and change. NAFOA will be holding its 2016 Fall Finance and Tribal Economies Conference at the Sheraton/Le Meridien Hotel in Charlotte, NC on September 18-20. For more information about the organization, visit www.nafoa.org.